Testing for the stress hormone cortisol plus depressive symptoms may help doctors identify boys at high risk for clinical depression, British researchers say. 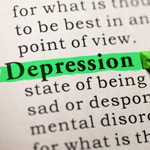 Ian Goodyer of the Cambridge University's Department of Psychiatry said teenage boys with symptoms of depression and raised levels of the stress hormone cortisol were up to 14 times more likely to develop major depression than those without these traits. The study, published in Proceedings of the National Academies of Science, identified the first biomarker for major, or clinical, depression, which could result in boys at greatest risk of depression being identified for depression and treated earlier. "Through our research, we now have a very real way of identifying those teenage boys most likely to develop clinical depression," Goodyer said in a statement. "This will help us strategically target preventions and interventions at these individuals and hopefully help reduce their risk of serious episodes of depression and their consequences in adult life." The researcher team collected samples of saliva from hundreds of teenagers and measured the levels of cortisol, as well as self-reported information on symptoms of depression. The researchers divide the data of the teenagers into one of four groups depending on their cortisol levels and symptoms of depression. After tracking the teens for 12 to 36 months, they determined which group was most likely to develop clinical depression and other psychiatric disorders. Girls with high cortisol and depressive symptoms were four times more likely to develop clinical depression than those with neither, suggesting gender differences in how depression develops, the researchers said.